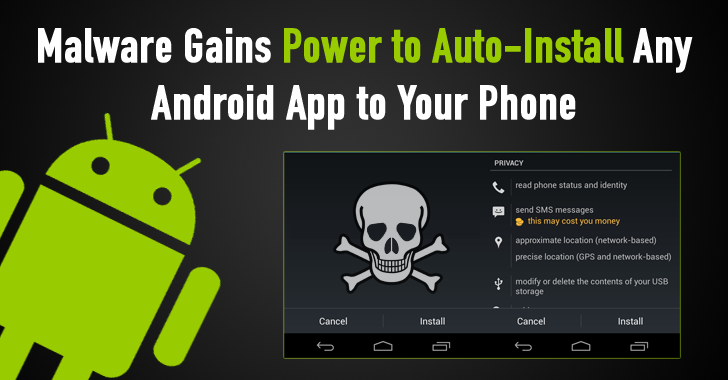 Security researchers have uncovered a trojanized adware family that has the capability to automatically install any app on an Android device by abusing the operating system's accessibility features. All the three adware families root-infect Android devices in order to prevent their removal and give attackers unrestricted access to the devices. It is worth noting that the malware does not exploit any flaw in the service to hijack an Android device and instead relies on the service's legitimate functionality. During the installation, apps from the Shedun adware family tricks users into granting them access to the Android Accessibility Service, which is meant to provide users alternative ways to interact with their smartphone devices. The trojanized app actually masquerades itself as an official app available in Google Play Store and then is pushed to third-party markets. The worrisome part is that Shedun apps can't be easily uninstalled, as the apps root the victim's device and then embed themselves in the system partition in an effort to persist even after factory reset. Lookout categorized them as "Trojanized Adware" because the goal of this malware is to install third-party apps and serve aggressive advertising. Legitimate applications also use the Android Accessibility Service for features like to grant expanded capability to phone tinkerers. So, users are, as always, advised to carefully make use of the third-party app markets.